Place both pie crusts in half-sheet pan, overlapping slightly. Fit into pan, pressing into corners. Trim edges to about 1/2 inch overhanging sides of pan, then fold over and tuck into pan. Prick bottom with fork; place in freezer 20 minutes. Meanwhile, in 2-quart saucepan, mix 3/4 cup sugar, the cornstarch and salt with whisk. Beat in milk, followed by eggs, using whisk. Heat over medium heat to boiling until thickened, stirring constantly, 10 to 12 minutes. Press mixture through strainer to remove any lumps; stir in butter and 1 teaspoon vanilla. Refrigerate until completely cooled, 30 to 45 minutes. Heat oven to 400° F. Bake crust 15 to 20 minutes or until golden brown. Cool to room temperature, about 20 minutes. In medium bowl, beat cream with electric mixer on high speed until thickened. Add 1/4 cup sugar and 1 teaspoon vanilla; beat to soft peaks. 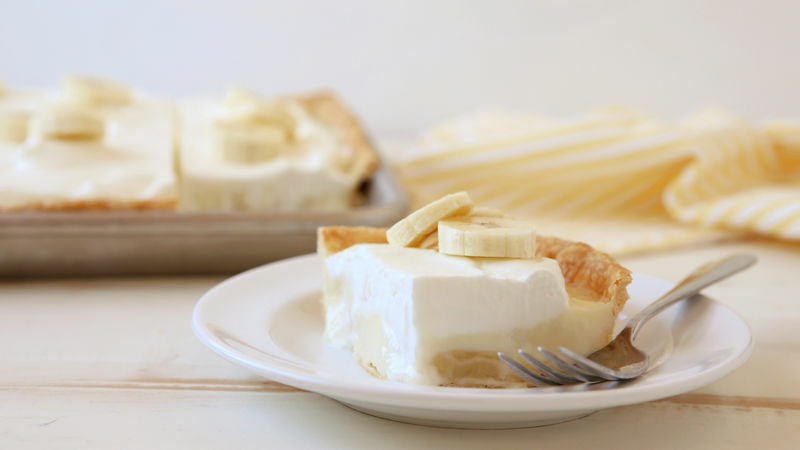 Line cooled pie crust with sliced bananas. Spread filling on top; cover with topping. Refrigerate 1 hour before serving. To ensure pie crust doesn’t shrink during baking, cover with greased foil, and fill with pie weights or dry beans before baking. Bake about 15 minutes or just until crust begins to brown, then remove weights and foil, and bake 5 minutes longer or until golden and crust appears dry. Use whole milk for a creamier filling; use 1% or 2% milk for a lighter filling. Cool the filling more quickly over an ice bath. Place filling in a bowl, then set inside of another bowl filled with ice and water. Stir about 5 minutes or until mixture is cooled.